Today the 165th Course of the Israel Air Force Flight Academy graduated and received their hard-won pilot’s wings. 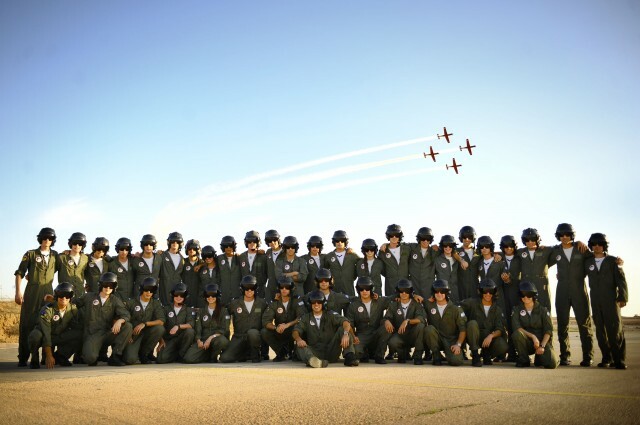 After three long years of training, the cadets turned official pilots and participated in a ceremony held at the Hatzerim Air Force Base. The ceremony was held in attendance of Israeli Prime Minister Benjamin Netanyahu, Minister of Defense Ehud Barak, Chief of Staff Lt. Gen. Benny Gantz, and Air Force Commander Maj. Gen. Amir Eshel, as well as friends and families of the cadets. The severe blow inflicted upon our enemies and the damage caused to terror infrastructure are largely due to the efforts of the pilots you’ve met — your mentors and commanders… and now, graduates, the next mission is yours. Today’s Air Force is a drawn and ready arrow. Once the string is released, the force is ready at any distance or border.